Carnitas’ Snack Shack founder/executive chef Hanis Cavin and partner/chef Willie DePasquale (Moceri Produce) are opening a new chef-driven barbecue joint in San Diego. Ivan Muñoz, (The Deck at Moonshine Flats), is on board as a consultant. 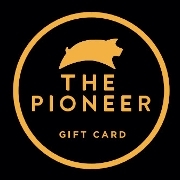 The Pioneer is now serving up mouth watering brisket, ribs, chicken, barbecue and burgers daily at 11:30am!